The PL100 Applicator is available with an Electric Tamp module. The PL100i-ET200 or PL100EPi-ET200 can be selected for your application. The Electric Tamp unit (ET200) provides 200mm stroke, rapid acceleration and deceleration, digital control of the tamp motion profile, elimination of two pneumatic cylinders and associated sensors and flow controls, and reduced compressed air consumption. 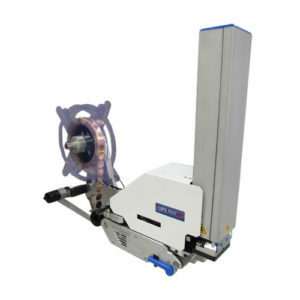 The ET200 Tamp is typically as fast, or faster, than our pneumatic tamp unit but with significantly greater control of the motion profile including a ‘push’ move in which the ET200 approaches the target rapidly then decelerates and applies the adhesive component at a controlled rate until a force threshold, based on motor torque, is met. This eliminates the impact and vibration resulting from a fast-moving pneumatic tamp actuator.